1974 WAS A PIVOTAL YEAR FOR ME. I found myself working in three communications media at the same time: in print (as an editor of the publication Radical Software), in video, and at the loom. It was a revelation to me that all three encode and decode information in lines. I was also drawn to the multichannel genre developing at that time because it most clearly challenged the traditional viewer-broadcaster relationship. The viewer had to leave the living room and go to a public space to view the work. And the loomwhich was actually the first computer on the face of the earth, in that it programs patterns according to a numerical structurewas the most sophisticated technology I could find to understand the programming of multiples. Conceiving of each monitor as a thread, I constructed the multichannel installation Dachau 1974 according to basic thread structures for binding a cloth, with channels one and three and channels two and four juxtaposing pairs of images as the work proceeded in time. In essence, I created a nonverbal narrative structure based on a visual, and not a literary, source. This distinction was very important to me. The visual structure of woven cloth, based on the buildup of lines, precedes human writing by thousands of years and holds a key to the organization of visual and textual information. The words text and weave share the same Latin root. 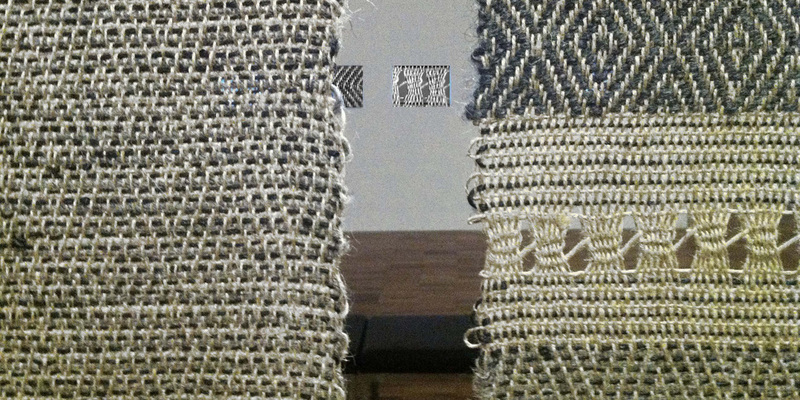 Beryl Korot, Text and Commentary (detail), 1976–77, weavings, drawings, five-channel video (black-and-white, sound, 30 minutes). Installation view. Text and Commentary is a handmade work created for the camera. 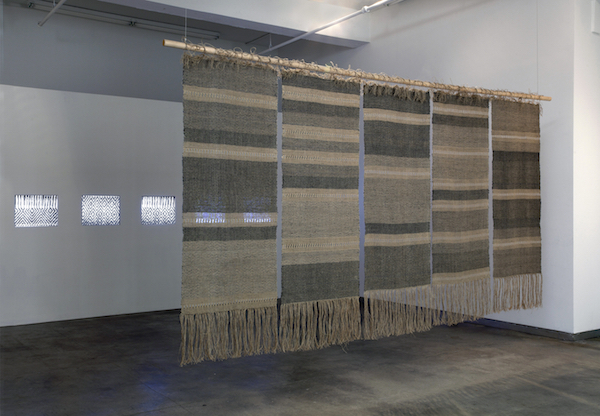 Five weavings hang from a dowel facing five video monitors built into a freestanding wall. As I wove at the loom, I hung a camera from the ceiling to record the process at varying distances. The images became quite abstract. I edited the piece by drawing all the images I shot on three-by-five cards and spreading them out on the floor to come up with a sequence of images. The work produces a dialogue between an ancient technology and the then-new medium of video. When it is exhibited, there’s also a pictographic score for the five channels of video as well as five weavers’ notations. All elements of the work coexist and provide varying perspectives of virtually the same information, but within the limitations of each medium. Currently I’m working on “Curves,” which is a series of abstract drawings on paper, made with ink, pencil, and thread, that reference the human torso. As these works develop, threads are sewn on the surface of the paper with a digital sewing machine. The relationship between the handmade and the machine-made is basic to this work. Instead of oil or watercolor, here the programmed structure of the threads allows the original drawn markings to be seen in a new way and adds texture, color, and depth to the surface of the work. The sewing machine is programmed to sew on the surface of the paper in pre-designated areas. The kind of stitching, with its shape and degrees of being open or closed to the surface beneath, is another example of the impact of the computer on something as basic as the sewing machine.